I forgot to mention in last week’s post about mordanting that there is an exception to the rule that fabrics must be mordanted before natural dyeing can be successful. That exception is indigo, for which the whole dyeing process is also somewhat different from that used for other natural dyes. You can skip the mordanting process when dyeing with indigo – you just put the unmordanted fabric straight into the dye bath. I’m still on holiday in the South of France at the moment, but one of the things on my ‘to do’ list for when I get back is some more indigo dyeing. I have a quilting project in mind that will use some natuarally-dyed blues and purples, so I intend to build up some stocks. More about this, no doubt, in a future post. 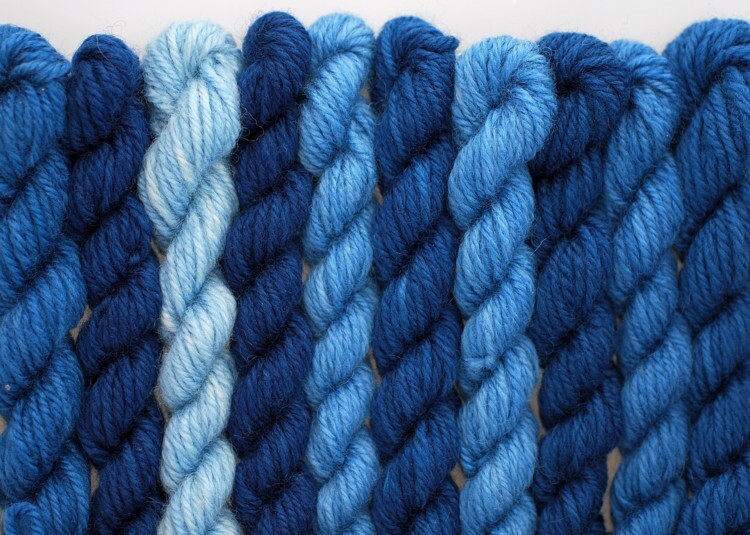 The picture in this post shows just a few of the wonderful shades that can be achieved with indigo dyeing. Mordanting is the crucial first step before dyeing fabric using the natural dyes I’ve described in earlier posts. And it really is a bit tedious, especially at first when you have to curb your impatience and go through the mordanting process in order to get onto the magical process of dyeing. But it really is crucial; if you don’t mordant the fabric first, it won’t take the dye (I’ve tried dyeing unmordanted fabric and it’s not worth the effort). 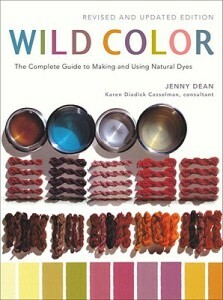 I have one book about dyeing that I refer to constantly: ‘Wild Colour’ by Jenny Dean. She describes a mordant as follows: “A mordant is a substance that has an affinity with both the materials to be dyed and the natural plant dyestuff. Acting as a bond between the two, a mordant helps the dye to become permanently fixed to the fibres”. There are several substances that are used for mordanting, but, just to complicate matters, the substance you use depends upon the nature of the fibres you want to dye. Animal fibres (wool and silk) can be mordanted with alum. It’s fairly safe, provided you don’t swallow it, and it can be obtained readily. I follow Jenny Dean’s recipe which involves heating up water and adding a solution of both alum and cream of tartar. Once the substances are thoroughly mixed with the water, you can add the fibres. Because it’s not a good idea to heat wool or silk for any length of time, I bring the mixture to the boil, gently stirring the fibres around to make sure the mordant is fully absorbed, and then turn off the heat and leave the pot for a minimum of 24 hours. Then I rinse everything out and hang the fibres out to dry. Really, it’s just not that difficult, and it consumes very little time. An alternative to alum is to use oxalic acid as a mordant for animal fibres; oxalic acid is obtained by boiling up rhubarb leaves. Now this really is poisonous, so you have to be quite careful about using it. As we have rhubarb in the garden I tried this method in the summer, and found that it produced an unexpectedly vivid yellow ochre colour, just by mordanting. I like this so much I kept some of it for use and you can see a bit of it in my latest Paul Klee-inspired work (see previous post on 30th January). For mordanting cotton and linen (plant-based fibres) the process is similar, but the mordanting substances are different. You can use tannin – I have some extract of tannin but haven’t yet tried it. Or you can use aluminium acetate, which is what I’ve used so far for plant-based fibres. I use silk, wool, cotton and linen in my stitching work, so I make sure that I keep supplies of all of these, mordanted and labelled so I don’t lose track of where I am. 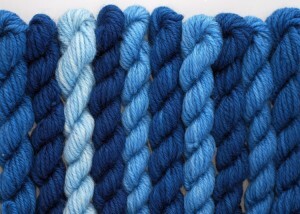 In another post I’ll write about my record-keeping for dyeing. I’m fairly systematic, and I like keeping a detailed record of what I’ve done. But more about that another time…. PS: Usually when I mention a book, I provide a link to the Amazon page so that you can get some idea of the price of the book, its availability and reviews. (I’m not advocating actually buying it from Amazon, you understand. Lots of people disapprove of Amazon because of e.g. its tax avoidance practices and its dominance in the market and I respect those views.) However, when I look up the Wild Colour book, I see that there is one new copy for sale for a staggering £185. I assume, therefore, that it is out of print at the moment. So I haven’t provided the link this time, but if you go to Amazon you’ll find seven 5-star reviews of the book. If you want it, you may be able to find a second hand copy, or if you have a public library service where you live, you might be able to get it that way. I think it’s definitely worth a look. I have used it extensively, and would happily give it 5 stars.